Product prices and availability are accurate as of 2019-04-11 11:26:23 EDT and are subject to change. Any price and availability information displayed on http://www.amazon.com/ at the time of purchase will apply to the purchase of this product. This software is a must have for anyone interested in losing weight and feeling better by following a low-carb lifestyle! 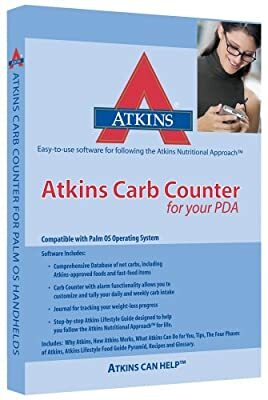 The Atkins Carb Counter helps you keep track of the foods you eat, even sounding an alarm to let you known when you have hit your maximum daily grams of net carbs. It also features the Atkins Lifestyle Guide, which includes tips and information from the experts at Atkins. You can lose weight and improve your health with the Atkins Carb Counter! Compreshensive database of net carbs, including Atkins-approved foods and fast-food items. Carb Counter with Alarm functionality allows you to customize and tally your daily and weekly carb intake. Journal for tracking your weight-loss progress. Step-by-step Atkins Lifestyle Guide designed to help you follow the Aktins Nutritional Approach for Life Historic charts to monitor your progress.